How to choreograph a circus act? Begin with the music. The track must inspire, repeatedly, yet be accessible to your desired audience. Finding this perfect piece can often be weeks or months of work. Dream. Listen to the music and forget your limits. Imagine the impossible. Fantasise the most powerful, beautiful, movements. Tap a desire to do justice to the highs and lows of the beautiful music of your favourite producers. Well, we can’t do everything, but with repetition and practice we can often do much more than we first think. Visualise those perfect moments but substitute the impossible moves with ones closer to your skills, still pushing your limits… „It would work, but only if I timed it perfectly..“ etc. Play. This is where you will find that some things don’t work like you dreamed, but stay motivated, listen to the beauty in the track, remember your visions. Certain moments of perfection will reveal themselves. Hold them close, adapt the rest. Refine. The essence of the piece should now be revealing itself. Smooth those connections. Tune those technicalities. Work around the gaps, answers will come. Eat. Sleep. Drink. Dance. Listen to other music, play with something else. and then show someone you trust, this fragile, impermanent, shadow of your dream, ask for straight up constructive criticism and take the honest feedback. It may sting, but the piece will be stronger for it. and before you think it’s ready…. perform it. Do it with confidence and spirit. Do it with authenticity. It won’t be exactly as you envision, but it will be enough, and the audience will see the genuine intentions and will appreciate it. Continue to refine and perform… This step repeats ad infinitum and only ends when you give up the piece. Hopefully by then you touched many people with it and can be proud of living your dreams. 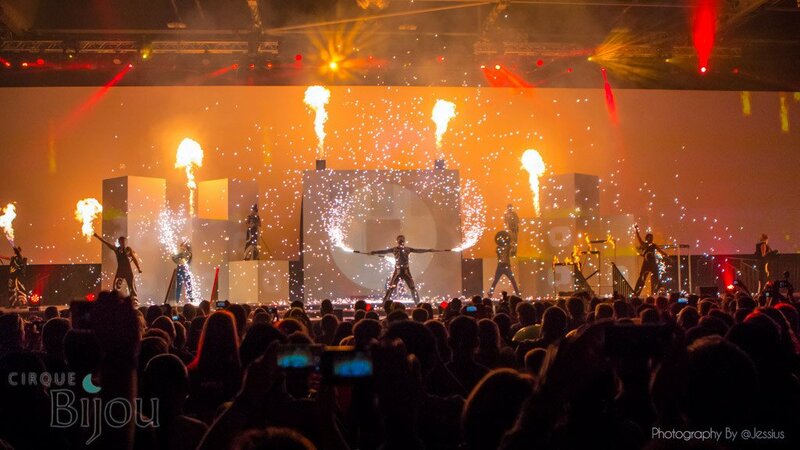 We were asked to co-direct the finale for Cirque Bijou’s stunning show for Minecon 2015 at the London Excel Centre. Editing a custom remix of a client selected track, we then conceived the show plot based on a collaboration of equipment from Cirque Bijou and our own supplies. 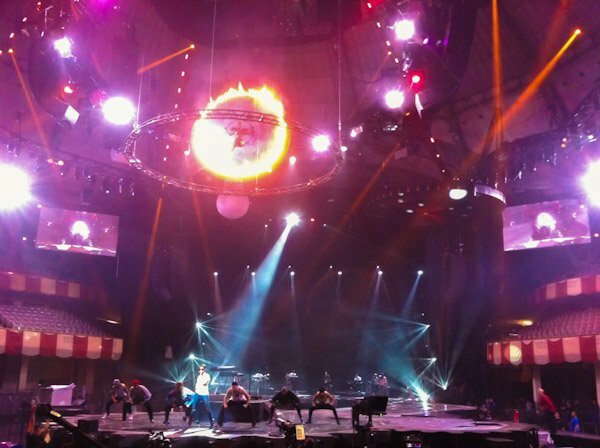 From time-coding the lighting and stage based pyro shots, to training cube spinners, dancers, aerialists and martial artists in the use of fire and pyrotechnic props. We incorporated our own CO2 units and even had the opportunity to be the first in the world to use the new arm mounted Galaxis Flamethrower systems. It was a fantastic cast & crew working on a very tight timeframe but the professionalism of the team ensured safety came first. Performed on a magnificent stage, complete with projection mapping and mountain bike stunts, with a live crowd 10,000 strong! Millions will shortly be able to view the capture of the show on web stream. We had the pleasure to direct the finale of the action packed Invisible Circus show on the amazing Jolly Dodger. To celebrate 500 years of Hampton Court Palace history the palace’s south facade will be brought to life with a dramatic display of projection-mapped animation, music and pyrotechnics. 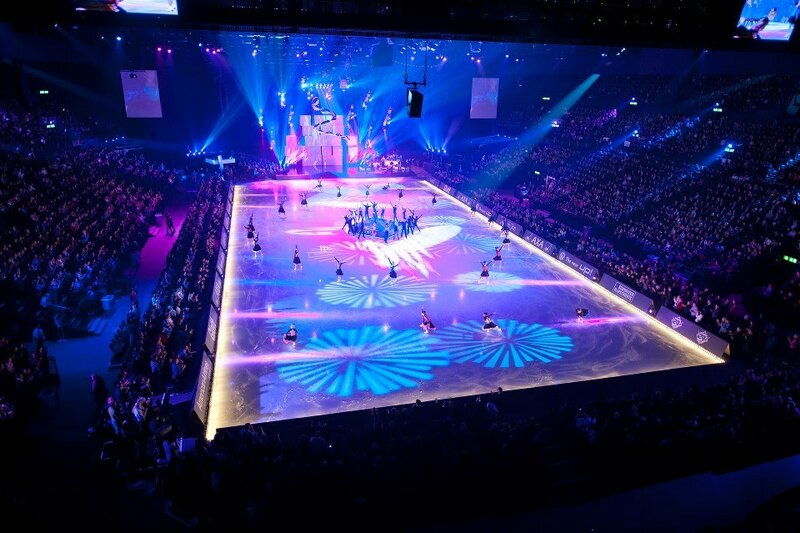 We have the honour to provide a bespoke fire and pyrotechnic effects show for this spectacular event spanning 3 nights. 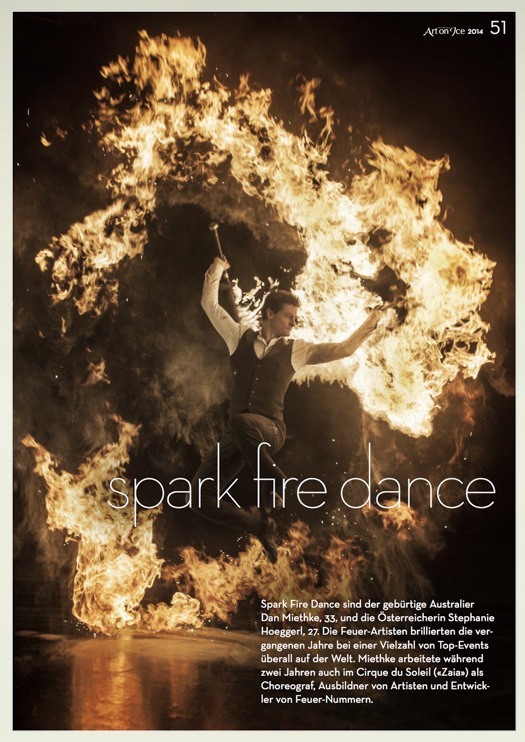 A beautiful event at Hampton Court and an opportunity to see Spark Fire Dance perform live. We’ve been busy! End of the year is always a crunch and we’ve been a bit slack on the updates… So here’s a concise list of some of the things we’ve been up to the past 6 months! Piratical adventures with the Invisible Circus on the Jolly Dodger, a full scale 80ft pirate ship built onsite for Boomtown Fair 2014. Another fantastic chance to work with this amazing crew who fought through blazing hot rehearsals and storms that threatened to break the ship apart (we did lose a lighting tower!) bringing a nail biting tale of the high seas to the eager crowd. 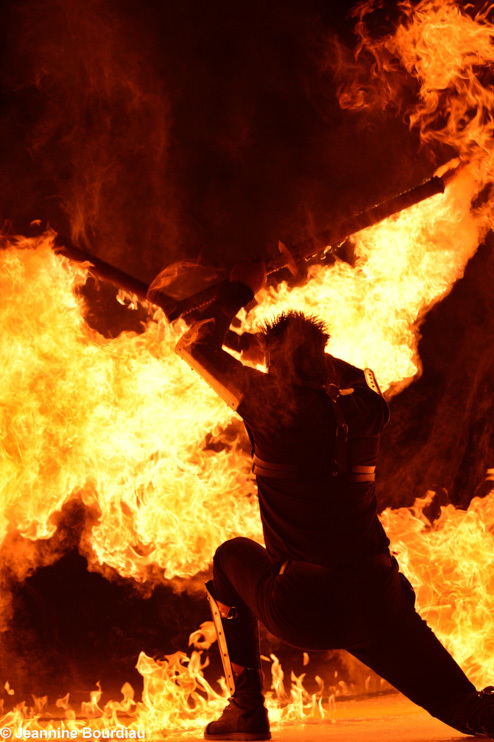 Spark Fire Dance were commissioned to create the finale for the show. An epic battle scene involving replica cannon shots and rockets fired over the crowds heads, sword fights, stunt falls and setting the ship on fire, literally! Two weeks of preparation included soundtrack creation, custom costumes and design of the ship mounted pyrotechnics display which featured line rockets, maroons, bengals, flares, airbursts and 28 simulated cannon shots from the portside guns. 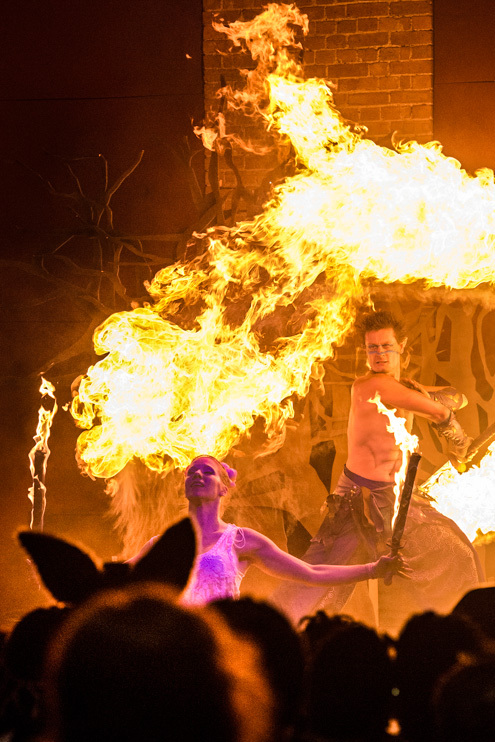 We choreographed the onstage action to ensure maximum effect from our signature Dragon Fire systems and handheld pyro props while ensuring the safety of the cast and crew despite wind hazards and proximity. 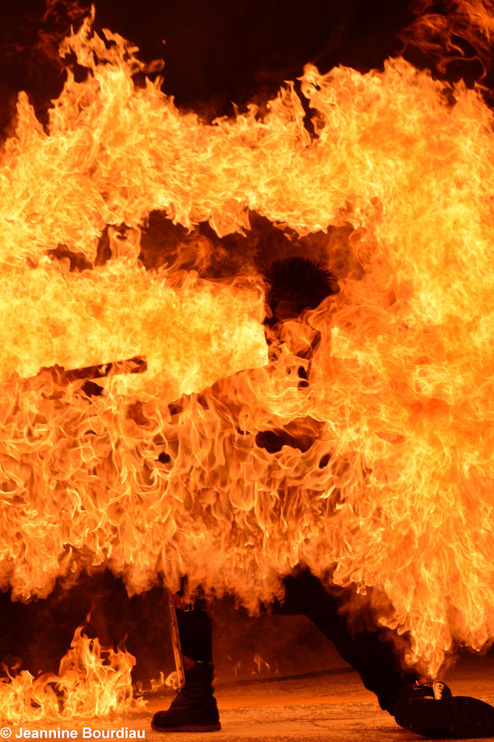 One of the interesting challenges of this production was providing a 10m wide deck fire effect to simulate the Jolly Roger on fire in the midst of lighting, monitors, authentic heshian rigging and wooden decking. Site specific risk assessments were prepared factoring in the distinct hazards of the set and situation including the unpredictable wind. A speciality low flash point fuel dispersal system was built to facilitate the effect, successfully lighting up the whole side of the ship while allowing the cast to safely perform just two feet away from the flames and ensuring sets and equipment were never affected. Some great shots of the action below. We’re eagerly waiting for some spider cam footage from the show and will post it soon! A very special Fire Coach and Flame Effects consulting contract off to a good start with a Langfang mission success. 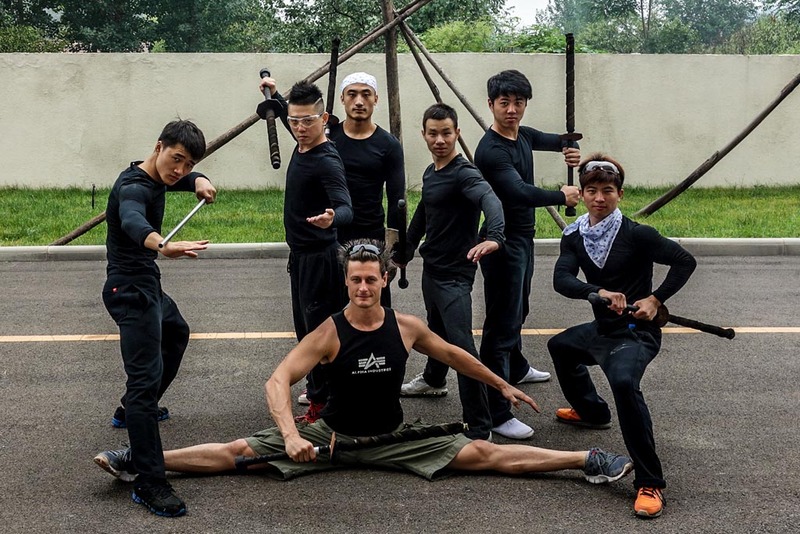 2 x 18 hour transits, 5 x 12 hour days coaching in up to 36 degree heat, 6 crazy ninja’s and 2 fire stewards trained and ready for action.Dan drilled these cast and crew with as much fire knowledge as he could cram in thanks to the help of 4 translators, 18 technical and safety documents, 6 mandarin translations and 2 extensive reports. 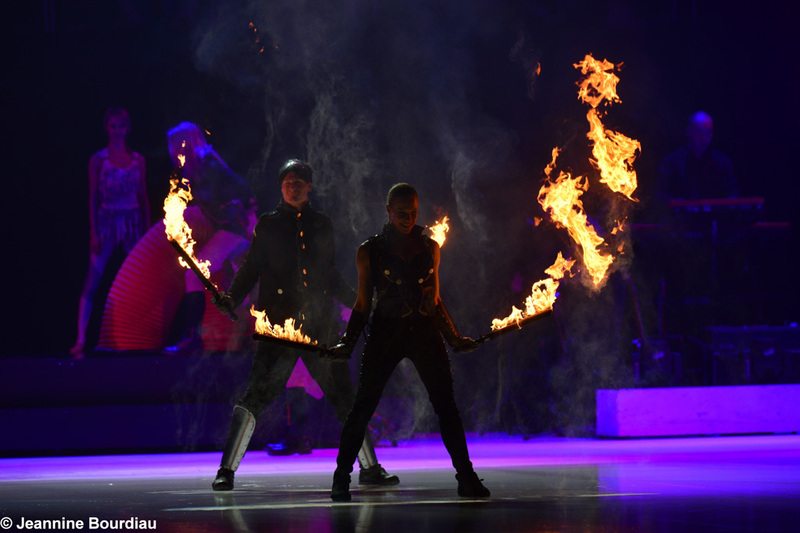 This production now has some pretty cool fire to play with.This top secret creation by one of the worlds premiere show makers is definitely ambitious and will be a very impressive spectacle. Hosted in a 40 million dollar custom built theatre with three 11 x 7 meter moveable LED screens, 2,000 seats that rotate to reveal an 8-meter-deep pool, and many many more surprises… If you can drop by Wuhan after Dec 20th we highly recommend you check it out! . 2014 has been non stop so far! After returning from the tour with Art on Ice through Switzerland, Sweden and Finland (see the spectacular photo’s here) we were soon off to rather an adventurous gig in Nigeria. Two promotional nights in the city of Enugu for one of the countries largest beverage companies. Despite an unfortunately necessary heavy security presence after an attempted car jacking the event was great fun and well received by a very excited crowd. Several TV interviews, 6 acts over 2 nights and sharing the stage with former colleagues and good friends from Cirque du Soleil! Srikanta Barefoot and Jorge Silvestre. A rather exotic destination for a reunion performance! Next up was a special event in Mannheim Germany for the multinational software corporation SAP. The venue was an old fire station converted into an amazing events space. We welcomed the strict OH&S requirements and provided a demonstration of our effects for the city fire marshall. A great chance to show off our extensive risk assessments and safety documentation which Stephanie prepared in German for the clients convenience. Back to the UK for a beautiful and unique garden party held on a simple gorgeous estate in Kent. 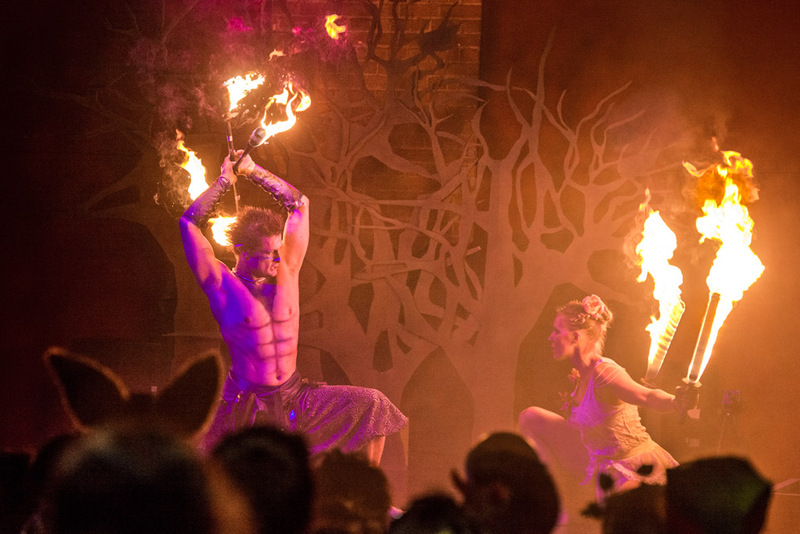 Themed ‚Midsummers Night Dream‘ we created custom fire elf characters to enchant the guests and bring a touch of magic into the night. We enjoyed it so much, and received such fantastic feedback we’ve developed the characters into a permanent act. Beautiful roving creatures available for weddings, anniversaries and other outdoor events. 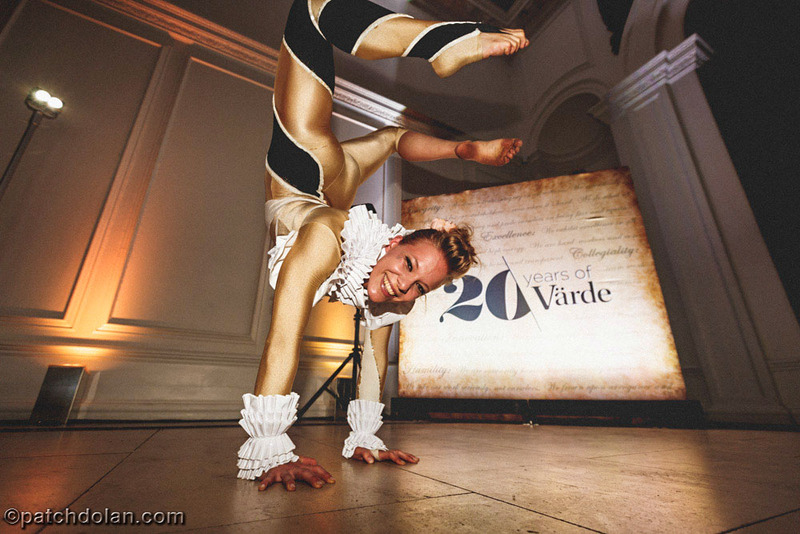 Some more recent shows include a spectacular company anniversary for Värde at Kensington Palace, a 50’s theme remix of our Electroswing fire show for a performance at the O2 arena, and a completely bespoke commissioned piece based on Grimms Fairy Tales for a very special private party in London’s Village Underground. Some pictures and recent feedback below, More on the way soon plus some very exciting news and developments! „I knew from your video clips & past experience that you’d be good, but I had no idea just how spectacular, how daring, how imaginative & yes magical, your sets would be. Your act is poetic & powerful. I love the way you used the space of the garden to create surprise, your entrances & exits perfectly judged the crowd & atmosphere. They added a highly charged & gorgeous energy to the evening, that I shall never forget. I wanted to say a MASSIVE THANK YOU for Saturday! You were truly amazing and the show you devised was stunning!… and how on it you are with H&S. It really put me at ease! What do you mean by Clean Burning fuel and would you consider White Gas (Coleman’s Fuel) to be clean? Well that’s a bit subjective. ‚Clean‘ is a meaningless term except in marketing and perhaps I should not have used it. You could take ‚clean‘ to mean odourless, smoke/carbon black free or non toxic, and in 2 of those 3 definitions ‚Coleman’s‘ is clearly a better choice than some of the Australians kerosene use or the British with their paraffin. However if your looking at a lack of potential toxicity then some of the isoparaffins are the clear winner. These are highly refined aliphatic branched chain isomers with a high degree of purity and specific properties including very little or no odour. I use isoparrafins with very very low naphthalene (not to be confused with naphthas) sulphur and aromatic contents (aromatic has nothing to do with smell but for hydrocarbons refers to benzene/toluene i.e. bad stuff). I like to see aromatics lower that 0.05% and prefer 0.01% or lower. The great thing is isoparaffins are available in a range of flash points and are used in a range of specialist industries worldwide. It doesn’t mean you can pick them up at the corner store but they are available if you know how to request it from a distributor professionally. The perspective we need to keep in mind is the amount of exposure. 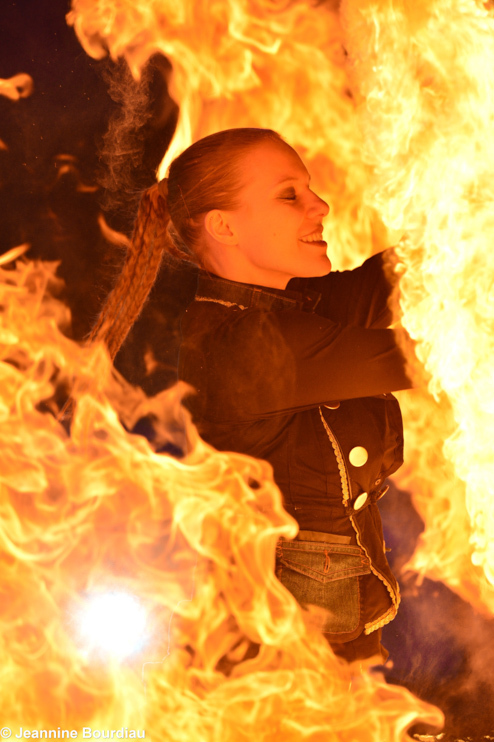 You might think your closely exposed while fire dancing but it’s actually relatively small exposure during the actual performance compared to amounts of fumes and vapours workers in the trucking or painting industries experience day to day. However the exposure prior and post performance could be of concern. You see given sufficient oxygen the complete combustion of any hydrocarbon produces just carbon dioxide and water. Combustion tends to be less complete as the number of carbon atoms in the fuel contents rise, typified by a yellow smoky flame which are carbons left over as the hydrogen bonds to the first available oxygen and the more complex volatile carbons get left over. Colemans is a mix of compounds with lower numbers of carbon atoms (shorter/lighter) than fuels such as lamp oils or the British ‚paraffins‘ (a frustratingly archaic and non specific term) which have more carbon atoms (longer/heavier… keep going heavier and you’ll get to wax). So Colemans burns relatively efficiently, quiet easily compared to heavier fuels… but it’s not during combustion where I would surmise the danger. I believe the danger for high exposure is during ’spinning off‘ when you are creating a dense cloud of vapour around yourself, and post show with left over vapours streaming off the hot props, not being burnt away but building up (especially in confined spaces) and being breathed in by the performers and anyone else backstage. So I advise, no matter the fuel, cover your mouth with a mask or cloth or at the very least hold your breath while spinning off until the vapour dissipates (or avoid that technique altogether, feel free to ask me how) AND when extinguishing a prop keep it wrapped in your wet towel (or wet molleton/duvetyne) until you can get it into a well ventilated area or it has cooled down entirely. If you want to be careful and professional then I would recommend a look into isoparaffins. Taking milk thistle extract and alpha lipoic acid semi regularly would also be a reasonable precaution. P.S. 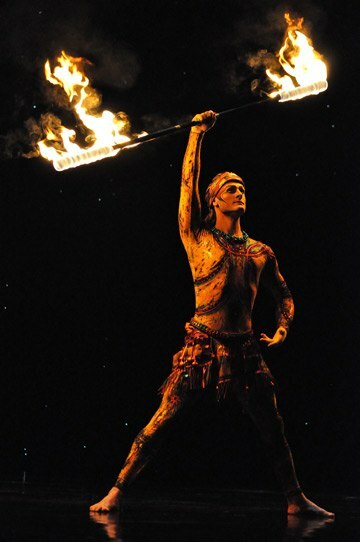 based on my reading and extrapolation of Cirque du Soleil’s results with Passive Organic Vapor Monitors during testing on the Zaia show, I would estimate we’re looking at exposure of 60-90ppm (as hexane) during fire performance, and between 500 up to a max of 1000ppm during spin off or next to hot extinguished props assuming a large indoor space. The 8-hour Time-Weighted-Average for n-hexane is 500 ppm (1800 mg/m3). Please credit Dan Miethke & sparkfiredance.com in all reproductions. I am not interesting in retailing fuel (for now) and am concerned for the health of my brothers and sisters so share the above with the best of intent however YMMV and all the above is not to be misconstrued as heath or chemistry advice from a professional! 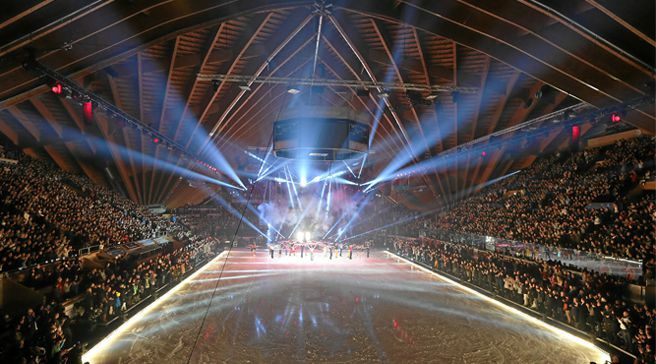 Check out our newest and biggest effects, created for Art on Ice and premiered in the Hallestadion in Zurich. 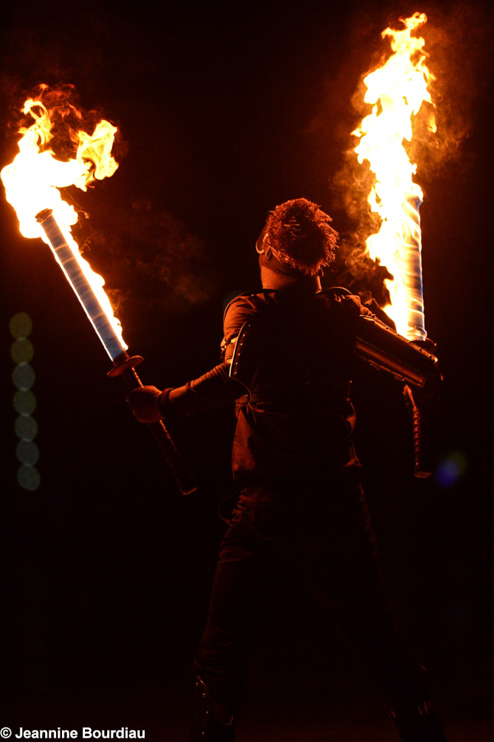 These massive fire swords create a huge cloud of fire with Dan in the middle of it all. 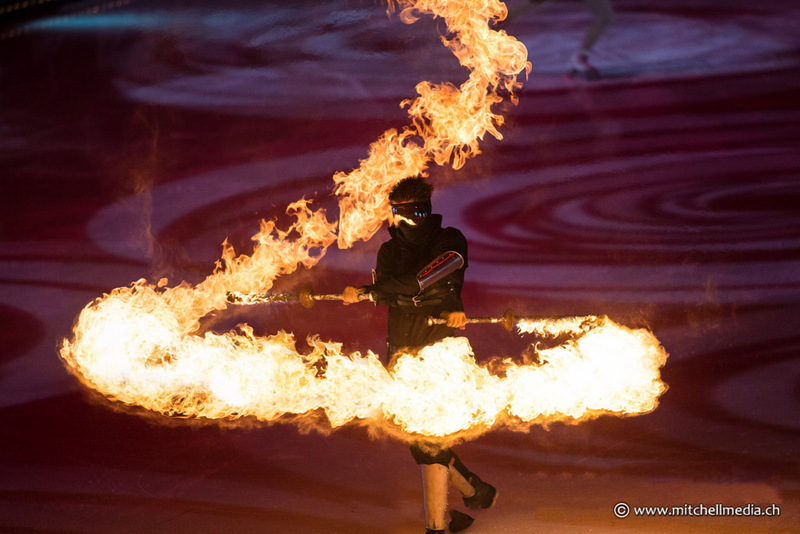 This fire stunt culminates in Dan lighting beautiful helix trails of fire on the ice. Such a fantastic cast and crew to work with. More footage and photos to come. The entire show will be broadcast on March 23rd. 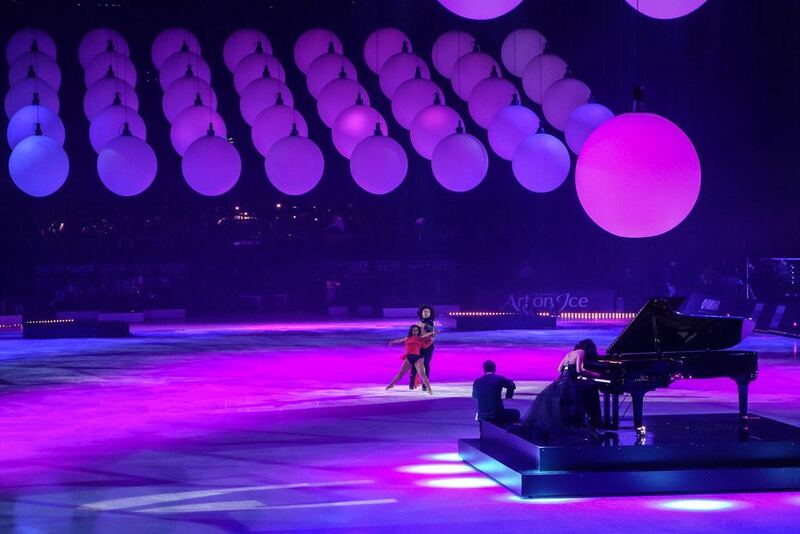 A wild week of effects design and testing, rehearsals, choreography and some last minute arrivals of the olympic gold medalist cast members, direct from Sochi, all culminating in our spectacular premiere show Thursday night!Resounding success to a huge crowd. 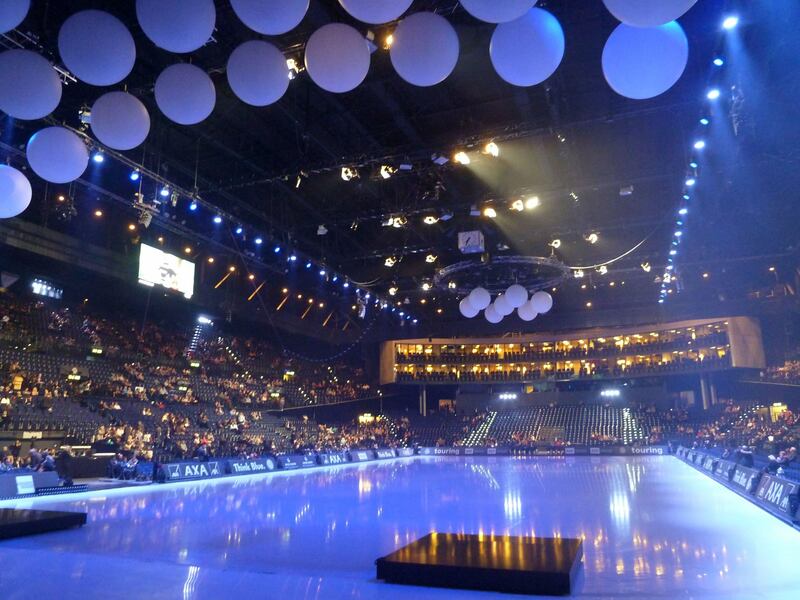 Ten thousand people in the Hallenstadion Zurich. One show done today, another tonight and two tomorrow, then we’re off to Lausanne. Zurich, Lausanne, Davos, Helsinki, Stockholm…. 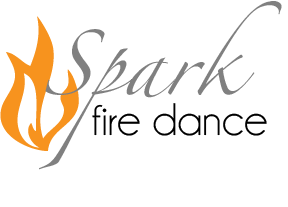 Spark Fire Dance on tour! 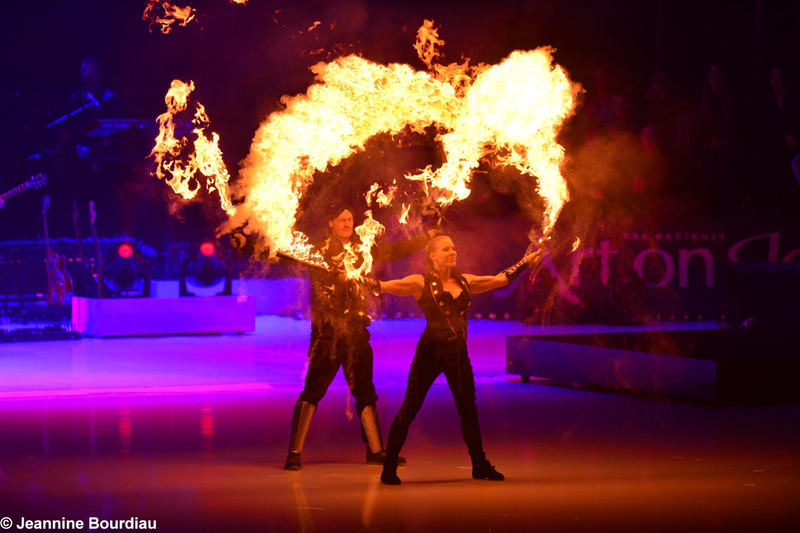 We’re flying out to Switzerland today to perform as part of the ‚Art on Ice‘ production, with a cast including ‚Hurts‘ and other former Cirque du Soleil and Olympic athletes!We’ll be presenting brand new even larger fire and special effects and will be literally setting the ice on fire in front of a projected tour live audience of more than 100,000 spectators. The shows will also be recorded and broadcast worldwide! 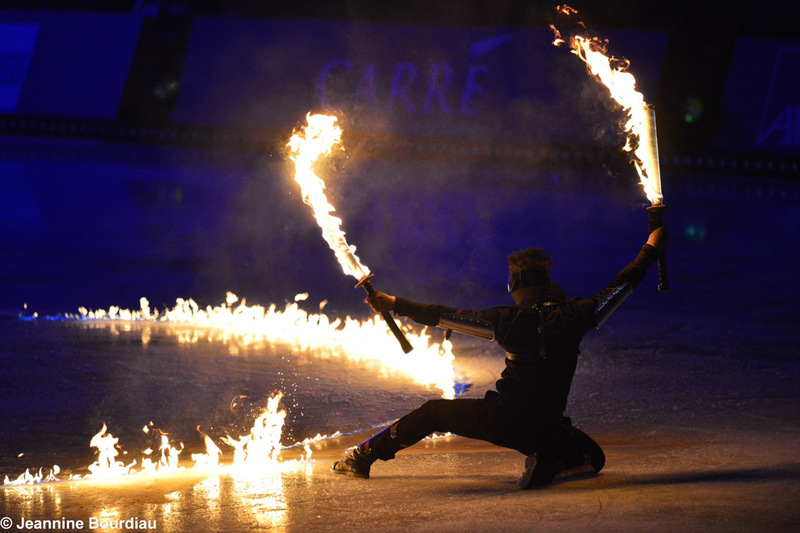 UK based Spark Fire Dance will be performing with Art on Ice 2014 tour, Zurich, Lausanne, Davos, Helsinki, Stockholm. 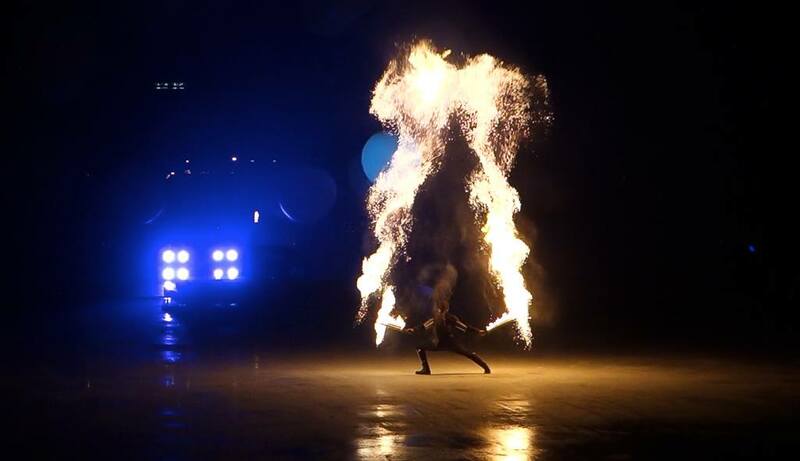 Check out Naomi Lynch, one of our amazing performers here at Spark Fire Dance, performing for Top Gear Live, setting porches alight with dual flamethrowers… in great slow motion! We feel that productions with budget can do better than to ask artists with highly skilled or dangerous acts to perform simply for ‚exposure‘. The only hesitation I have is the unfortunate issue we’ve encountered with many previous ‚Got Talent‘ enquiries, the inability of the producers to organise fee’s for the not inconsiderable time and effort of professional artists performance. Would this be different for the ‚grand daddy‘ of the Got Talent series, the American version? We had a fantastic experience with ‚Beat the Best‘ who not only pay full fees but also offer great tech support and whose guiding principle seems to be a desire to display their contestants and their skills in the best possible light. Unique new act based in London, available across the UK, Europe and the Middle East. We took part in the french version of ‚Beat the Best‘ where we performed our speciality Electroswing Fire Show. The pressure was on and had a hard time finding a suitable rehearsal space to accommodate our large scale special effects and stunts, but it all came together and we are very pleased to present our performance! 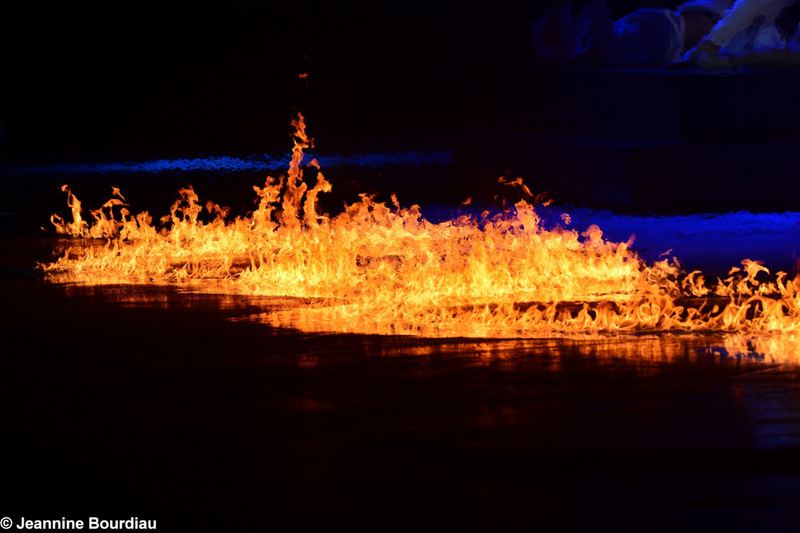 The jury was taken aback and felt the heat of our ‚Dragon Fire‚ effects and we loved their comments! 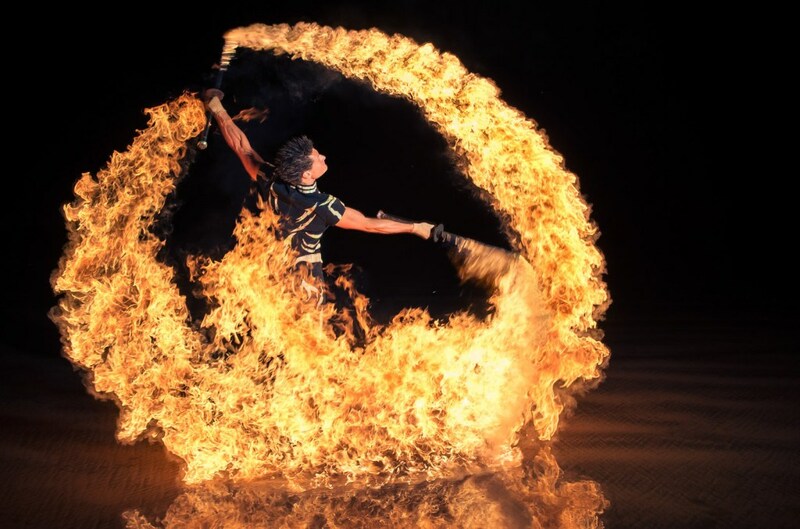 Dan and Steffi travel the world with their Fire Dance Show. 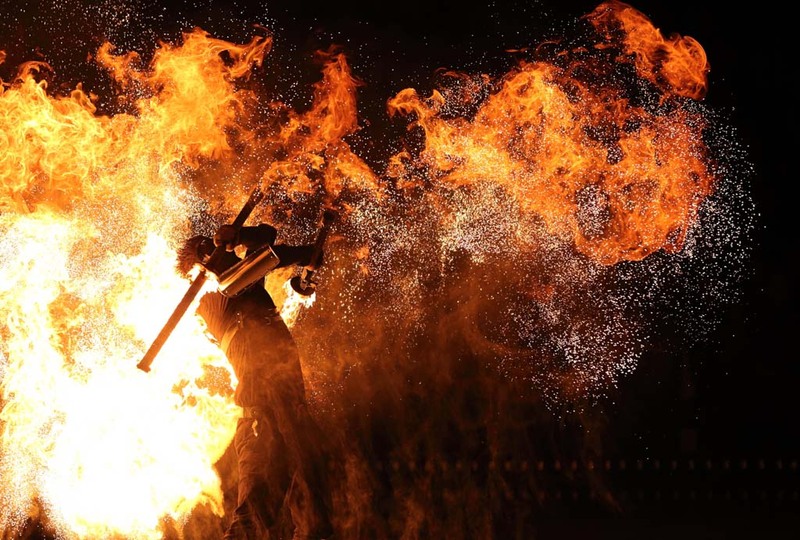 Dan: Fire dancing is a unique combination of prop manipulation, martial arts and dance. 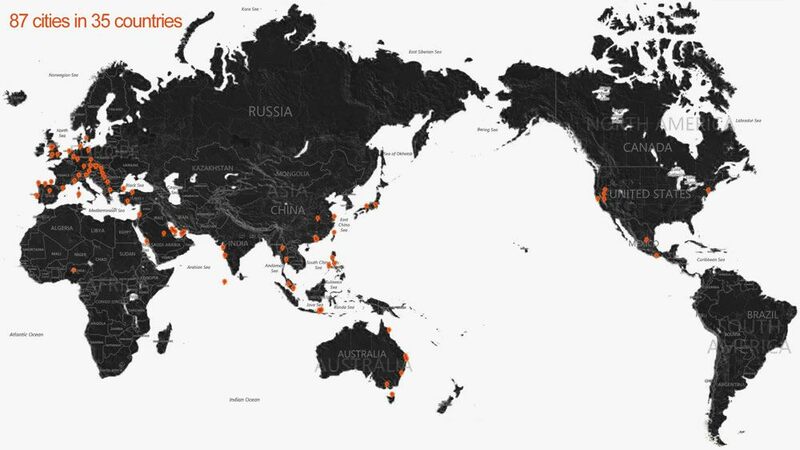 We’ve performed all over the world in over 80 cities and more than 40 countries around the world. 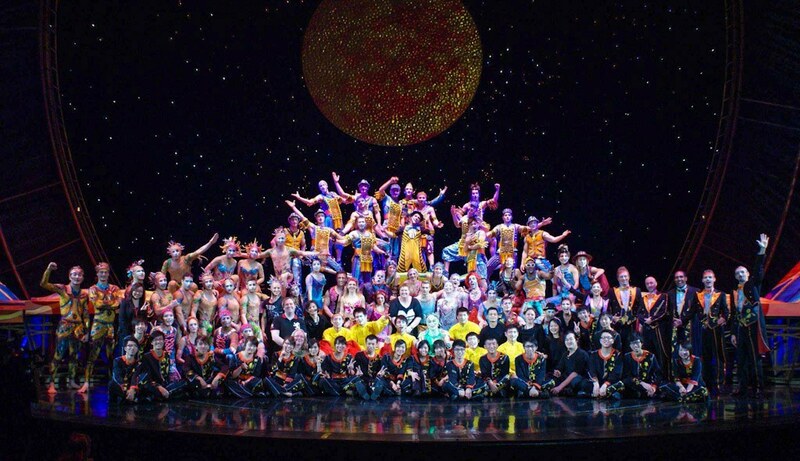 I’ve worked with Cirque du Soleil. 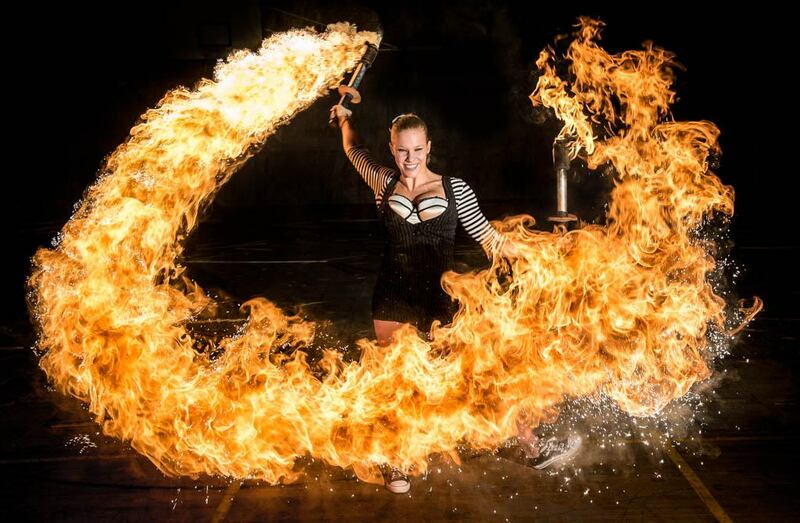 Normally the fire artists just light up the end of a prop and then complete figures by spinning, juggling and throwing the prop. Presenter: Dan and Steffi literally dance with the fire. 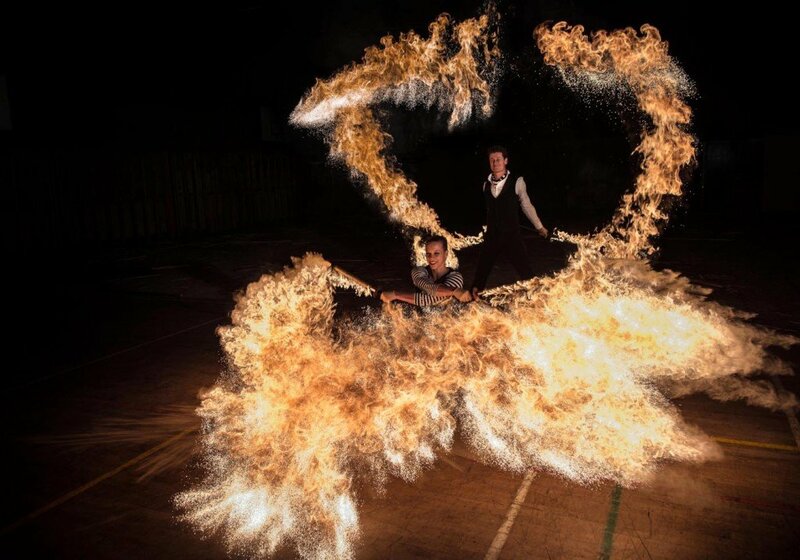 Dan has created their speciality props which allow them to include special effects into their circus acts, similar to a firebreather, as here where Dan literally sets his partner on fire. Dan: To be out there on stage with fire is to work with something that’s moving and alive. To manipulate that power and to work with that power is an amazing thing. Presenter: Their fire shows have been performed in more than 40 countries. 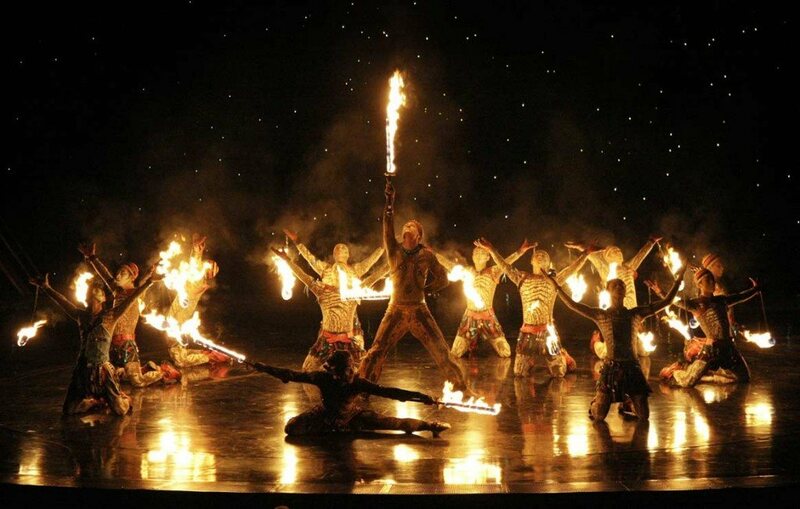 They dance with fire in an incredibly modern act created especially for this competition. 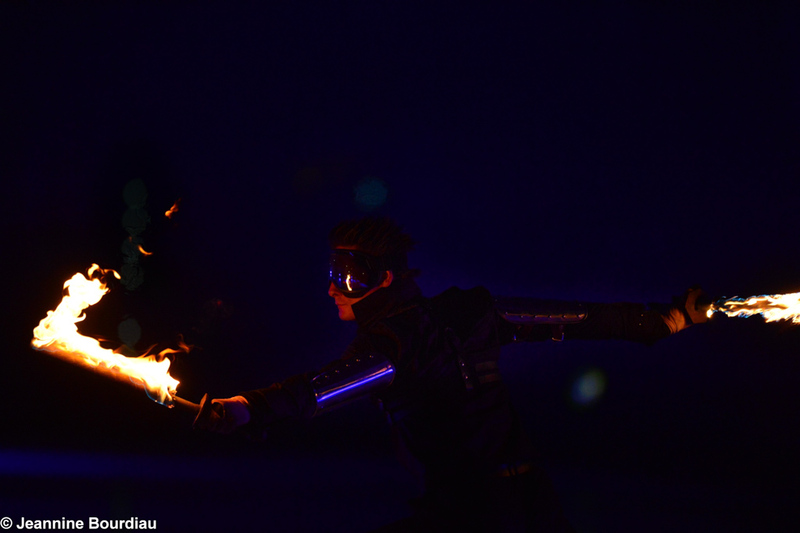 Welcome to the stage of “The Best”… Spark Fire Dance! Ladies and gentlemen please show your appreciation for Spark Fire Dance who have literally set the tent on fire tonight. It goes without saying that these are two experienced circus artists. Don’t try to do this at home next to the BBQ, it won’t work and it could be very dangerous. Well, Spark Fire Dance have they lit up the audience and the jury? We will know in just an moment. You have a few seconds to give the two of them a rating out of ten. Presenter: So was it ‘Wow’ for you Alessandra? Alessandra: Absolutely, I’m scared of even a matchstick, so I was really amazed. I truly had the impression that I was part of a fire works display. There were sparks everywhere, even in my eyes, because it was so beautiful… and also what this very, very beautiful and talented Miss did with her sort of fans. I’ve seen it done before, but only with feathers – notably, Zizi Jeanmaire in a choreography of Roland Petit ‘Mon truc en Plumes’… I found this very, very beautiful, choreographically very accomplished. They are courageous, they are good looking, they are young, Truly they have a lot to offer … 8.1 points! Presenter: Arturo, what did you think of this number? Arturo: I have truly never seen anything like it. I liked the mix of Jazz with Fire, it gave visions of some kind of gambling den or casino, with the devil playing cards. The production is extraordinary. It reminded me of the acts that were performed back in the grand theatres of music halls, some rare exceptional acts of the 40s and 50s… truly! So, I gave you 7.5 points. Presenter: Well, this is equally a good score for Arturo Brachetti, a very good score! Lara: I thought that the level of difficulty transcended was absolute. I think if you play with an element so vivd and so dangerous as fire with such mastery, you can’t be anything but ‘The Best’. Alessandra is right in repeating, you are exceptional. Unique in what you do and very novel. I’ve given you 7.5 points. 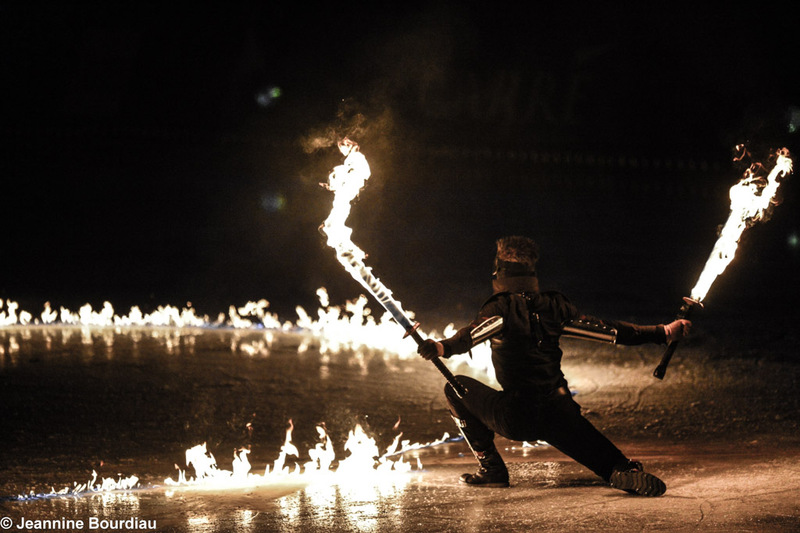 Sébastien: In The United Sates I see a lot of fire acts, fire eaters, fire jugglers, Thus I loved the innovations here. He was able to research how to create much bigger flames. 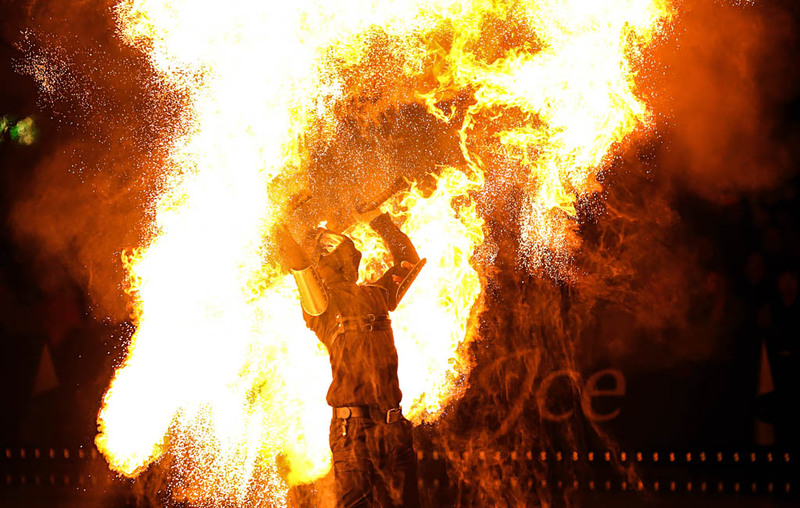 I like it when a fire performer is able to play with the risk and with the audience and to bring the flames so close to the audience as you did. Arturo: Lara, she’s got a tan now, look! Only from the front… You haven’t lost your eyelashes, have you? Sébastien: I think now at this level of prop manipulation, of knowing the fire, I really hope that they will continue pushing the limits and to create more works together. Presenter: All scores above 7 for Spark Fire Dance. In an instance we will se the average score of the jury. 7.6 points, excellent score! A tiny little bit lower than the one of Hamish McCann. It’s the public again that will make the difference. To go up these stairs you have to get a score higher than 16.4. The jury, I remind you, has given you a score of 7.6. Unfortunately this won’t be enough. Thank you, for your presentation. 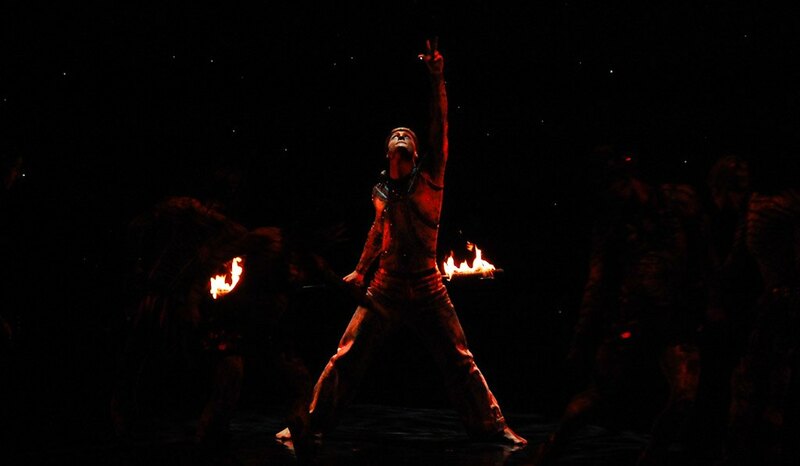 The deluge of fire and the choreography of Spark Fire Dance have not topped it. The competition stops here for Dan and Steffi. 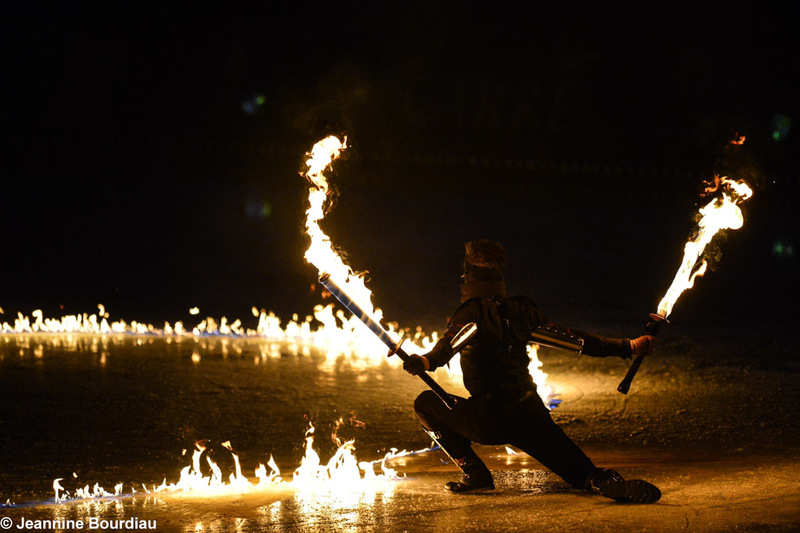 Alessandra: Spark Fire Dance – I found them outstanding, very dangerous and very impressive and very elegant at the same time. They act, they literally play with fire, acrobatics, dance, all of it. 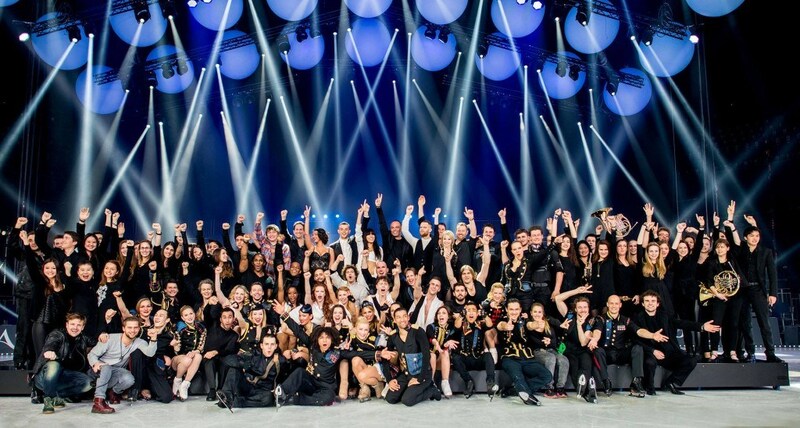 Thanks to The Best, we can see they are dream makers…. I think they could have very well risen to the Finals! 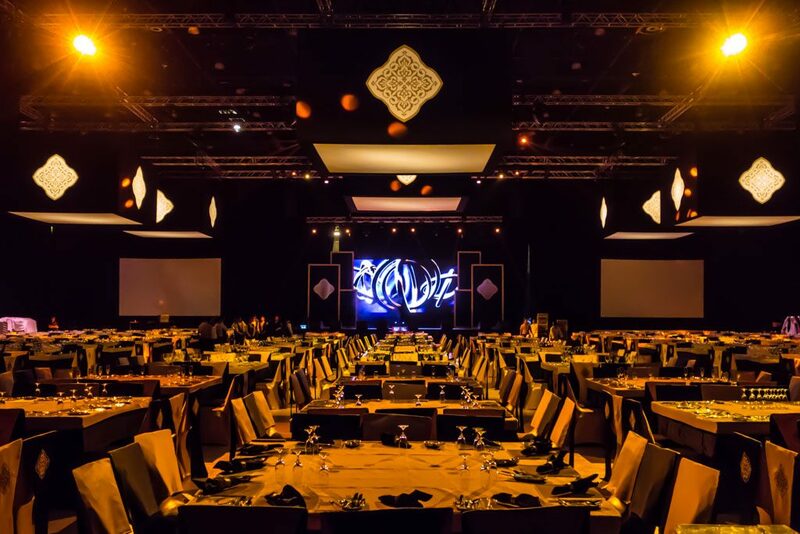 We’re thrilled to be back in Dubai for New Years Eve at the luxurious Madinat Jumeirah Arabian Resort, the largest resort in the emirate. 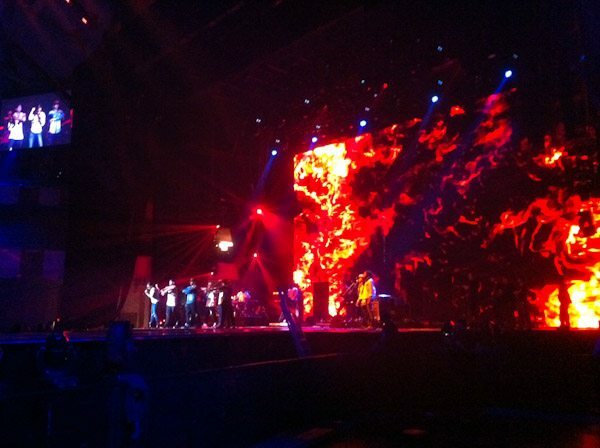 Here’s one of the four beautiful stages we’ll be performing on tomorrow night! 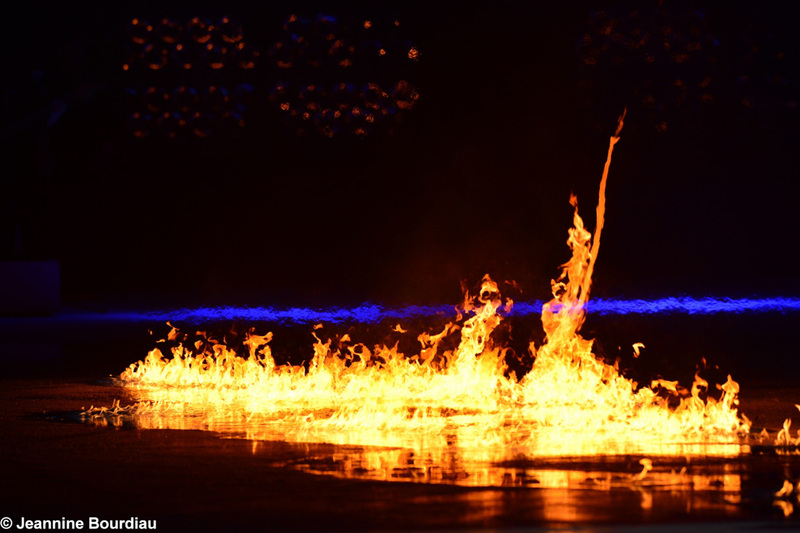 Another amazing shot here with Steffi’s Dragon fire in full swing. 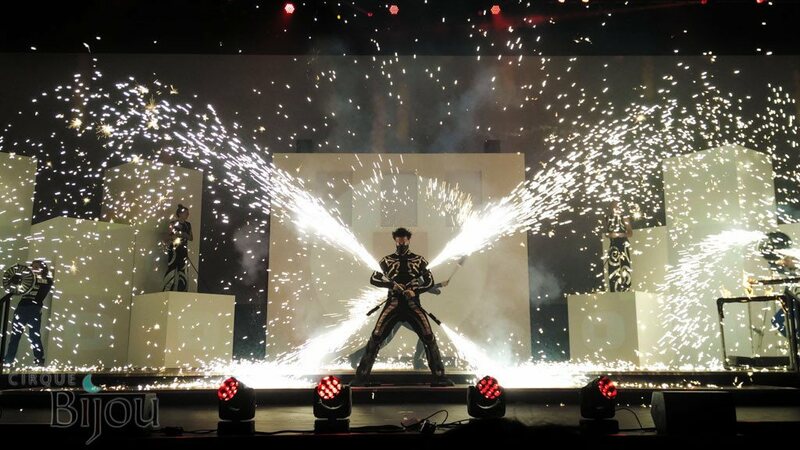 These effects create a beautiful finale for our acts that your audience can actually feel as the heat pushes them back in their seats. Luxury wedding entertainment ideas? Entertainment and production companies know that true quality is hard to find. 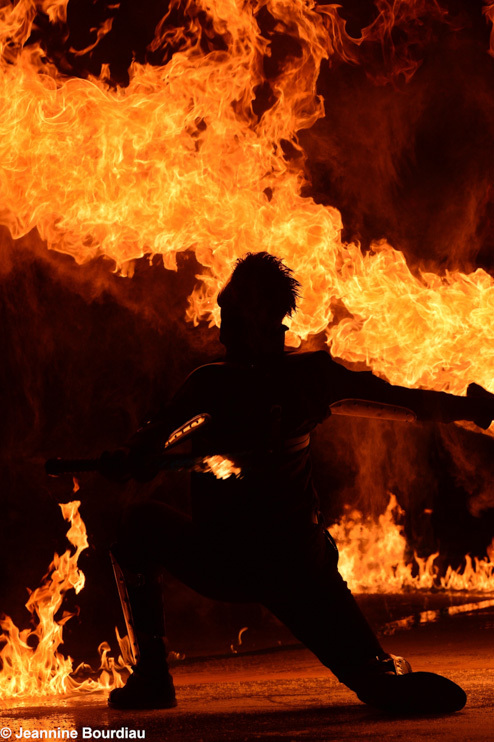 Our fire acts are perfect for those unique special events where you need excitement and impact and where anything less than the best is not an option. More control, less mess, professional fire performance. 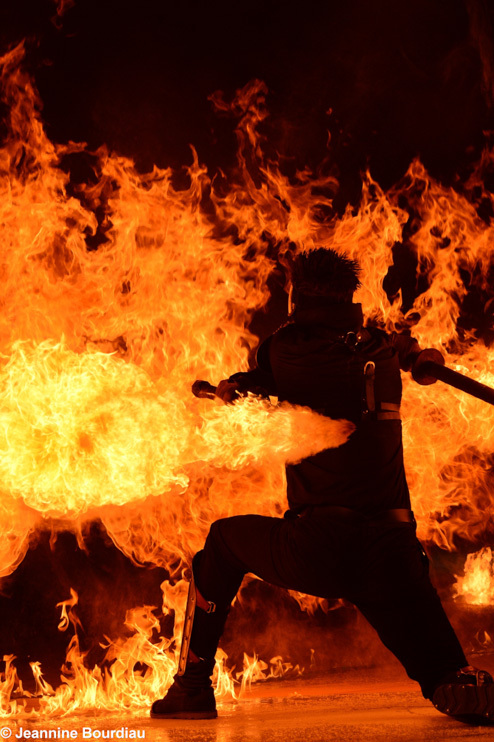 We recently collaborated with an acclaimed photographer from Getty images, Ian Gavan, on a mission to capture some of the full force of the fire we’re working with. Our first shoot with him was out on a beautiful beach location at Saunton Sands here in the UK.Heavy winds were a major challenge and we had to race to catch some sunset shots, but we persevered and got some amazing material thanks to Ians superb skills behind the lens.The shots will be going out as an interest pice to selected news agencies online galleries.Some more fantastic images will be posted over the next few weeks. We’re back in Mexico again for one of our favorite events, the San Luis Potosí Feria Nacional 2013! 3 days of intensive rehearsals and we’re hitting the stage with an innovative show featuring some amazing acrobats, shadow dancers and projection performances by Flowmotion Dance Company. Three power packing 16k lumen projectors making it a remarkable light show. 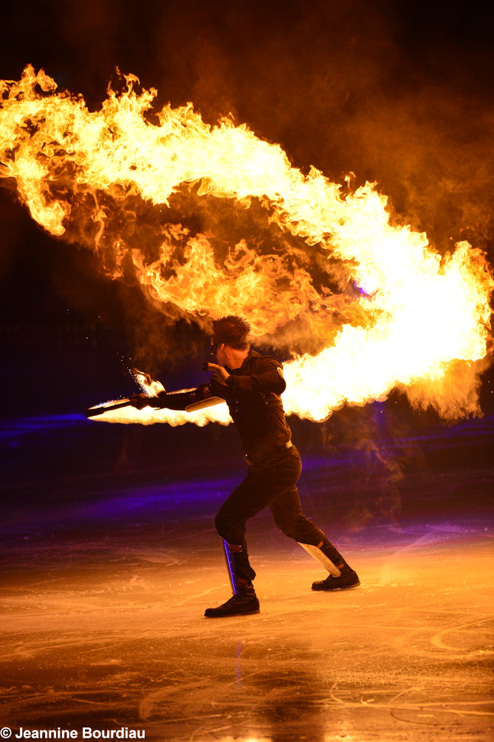 The audiences are loving our signature ‘Dragons Breath’ fireball effects, similar in effect to a firebreathers burst, it’s a fantastic human flamethrower impression, without any of the health dangers or messiness of firebreathing! 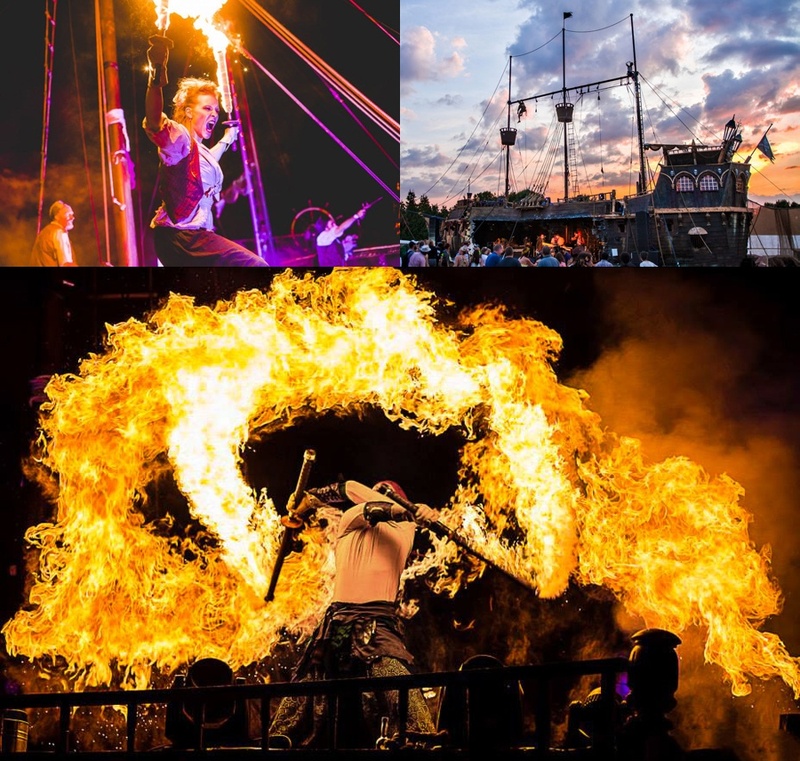 We have flame masters shooting propane flames across the top of the 16 meter wide stage as our pyro dancers add maximum wow factor to the show with pyrotechnic doublestaffs and poi. A fantastic fire and light show for a very appreciative local audience. 20 shows here over the next 3 weeks, then on to Black Rock City, Nevada and Burning Man where we’ll be lighting up the events stages with a bespoke special effects show at Fractal Nation and Nexus with a heap of other great circus performers. It’ll be non stop party entertainment, but educational as well! 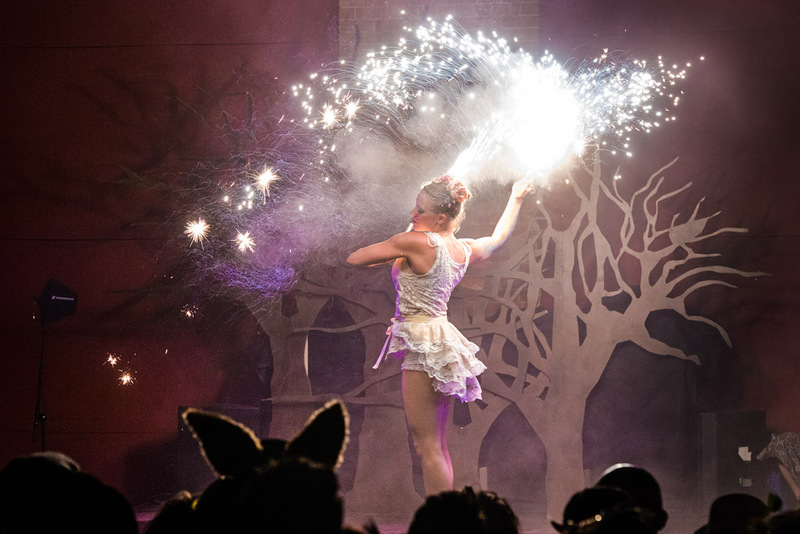 We’ll not only be canvasing the other entertainment companies and circus freaks for cutting edge event performance ideas but also dropping into the TEDxBlackRockCity which is at Burning Man for the third year in a row! The theme is ‚Paradigm shift‘ with a great lineup of speakers. Should be some fascinating material. We’ve just come back from a fantastic performance in Baku, the capital of Azerbaijan, where we performed ‘Fire Fury’ for the opening of the new Four Seasons Hotel. Overlooking the Caspian sea, Baku’s history is part of an ancient trade route from Persia through to the Ottoman empire. Between rehearsals we took a stroll through the city and noticed wild architectural contrasts, ranging from modern designs to buildings in the old city which date back as far as the 7th century. The water front promenade, just across the road from the Four Seasons, was beautiful at sun set and ideal for some handstand practice before preparing for our performance. Opening the event with some freestyle fire meet & greet we gave a warm welcome to all the invitees including the President of Azerbaijan and his entourage. From this fire performance we went on to get ready for the highlight of the evening. 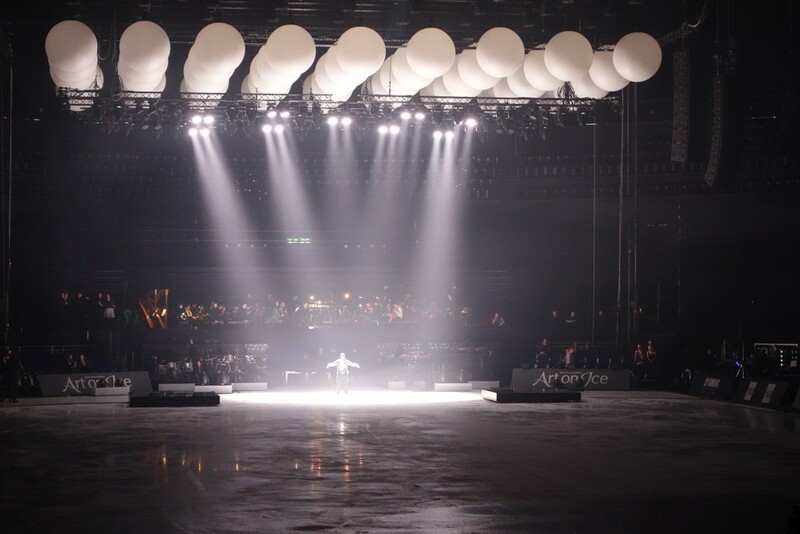 Working with a super team of artists Fire Fury was the finale to a customized production featuring acrobatic adagio, a cyr wheel act and a crack team from the world famous Gandini jugglers. The client was thrilled and invited us back next year. Mission success! Dan & Steffi will be performing at the MTV awards in Frankfurt, broadcast worldwide live on Sunday. 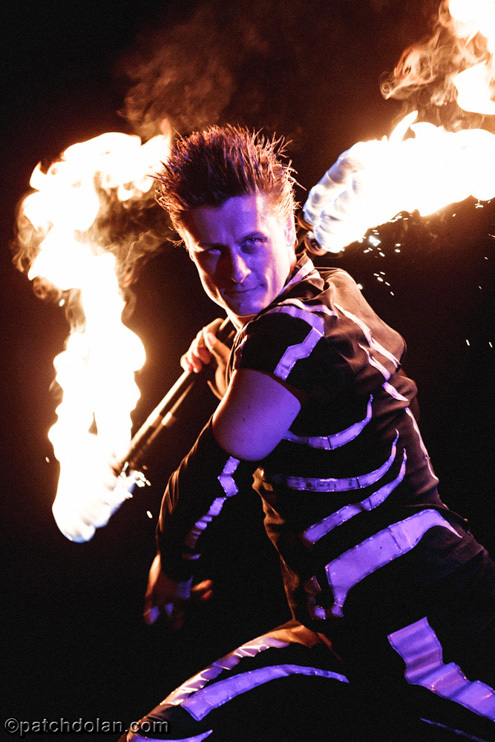 Dan will be doing some well hot Fire Sword effects and Steffi flaming skipping rope performed around the host Heidi Klum and during Psy’s performance of Gangnam Style. We have some massive fire effects, gorgeous custom fire fans choreography and fantastic handbalance on the main stage during Taylor Swifts closing performance. 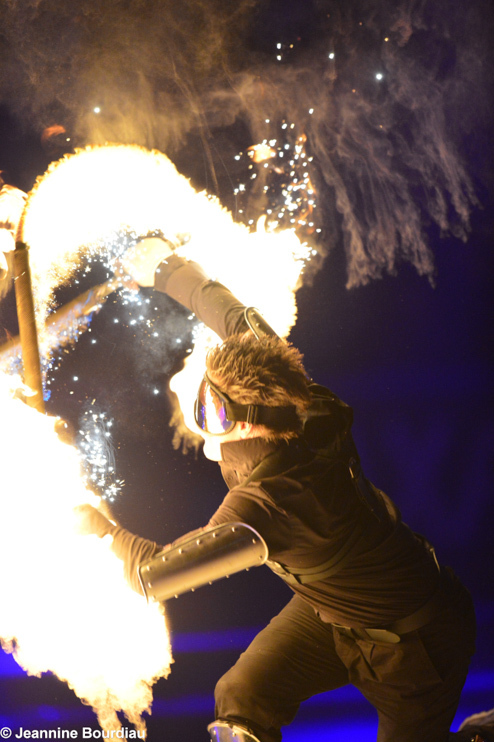 We’ve been working closely with some wonderful pyro guys from Germany’s premiere pyro company and the cast and artistic directors of Cirque Bijou, offering fire safety and fuels technical advice and performing our signature handheld fireball effects throughout the production. It’s been a brilliant and action packed 4 days of rehearsal here in Frankfurt’s Festhalle, the bands are filtering in and we’re looking forward to being part of some amazing acts tomorrow night. No Doubt, Lady Gaga, Alicia Keys, Pink, Katy Perry, Psy and more. The decor is very steampunk carnivalesque and we’re all kitted up to suit! Tune in 9pm Central European time for the grand show. 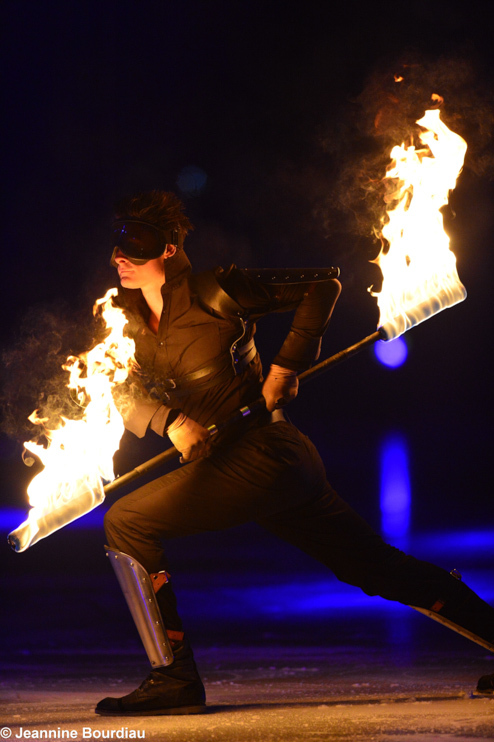 After 2 years day in and out with the largest fire act Cirque du Soleil has ever produced, we are again offering spectacular acts to the corporate events market. 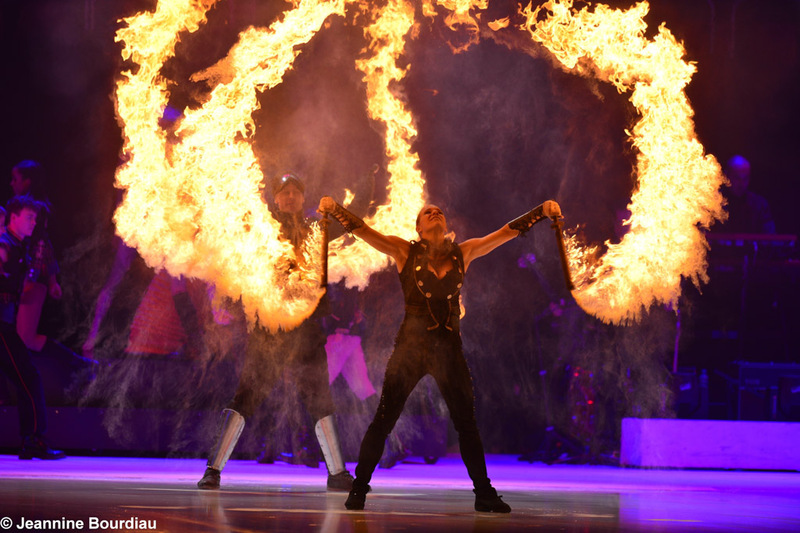 We’ve just returned from a production run on ‚Magic & Mystery‘ in Mexico, and our new act ‚Fire Fury‘ is now available. Electroswing footage is also on the way after an explosively successful film shoot in the Vienna studio’s! 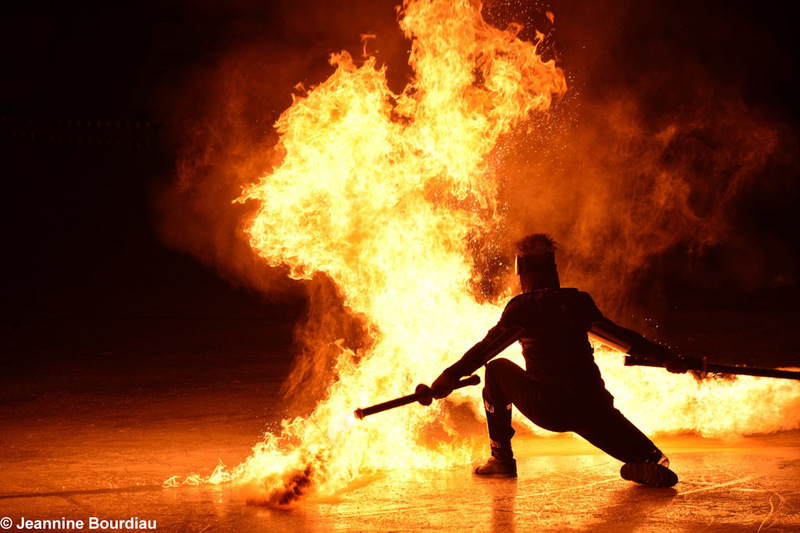 Now based in the UK and offering our latest unique and high power fire shows. 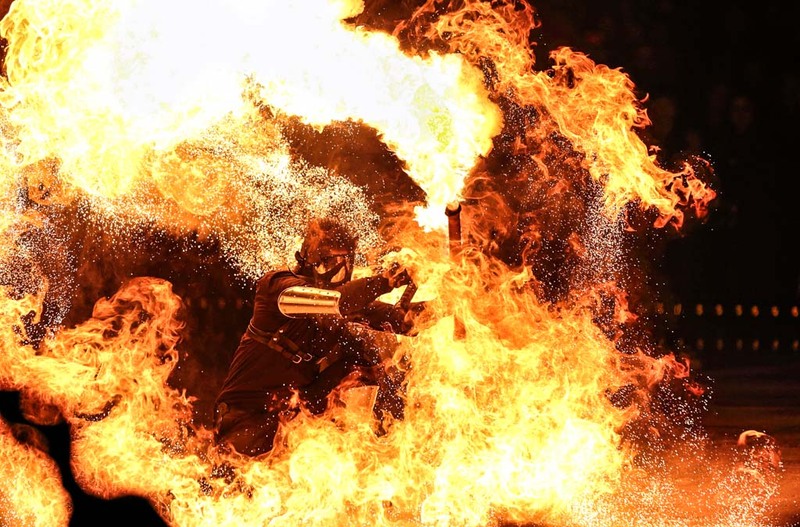 Keep an eye on this space for the latest developments in the world of fire performance…. 5-10 minutes before show start I get into costume and head to the training room, do some light stretching, say hi to a few people, get on the last bits of costume, head upstairs for my first cues as ‚the Sage‘. Every 4-5 weeks we get three days off which is a dream. Every 4 months we get a week ‚dark‘ (no show) which we count down for eagerly, like kids for xmas. Our show is in Asia so most artists fly out for a dark, either home or to holiday nearby in bali, thailand, philippines etc.